I have always loved a rainbow. When I was a kid my bedroom was actually decorated in a rainbow with bold rainbow bedding and blue carpeting. In my wedding, every bridesmaid wore a different bright color accent. And you should see my house now!! It's been bombed with color. (I figure if you use ALL of the colors, nothing has to match, right?) So that's what I did with my latest blanket design. MUST. USE. ALL. THE. COLORS. 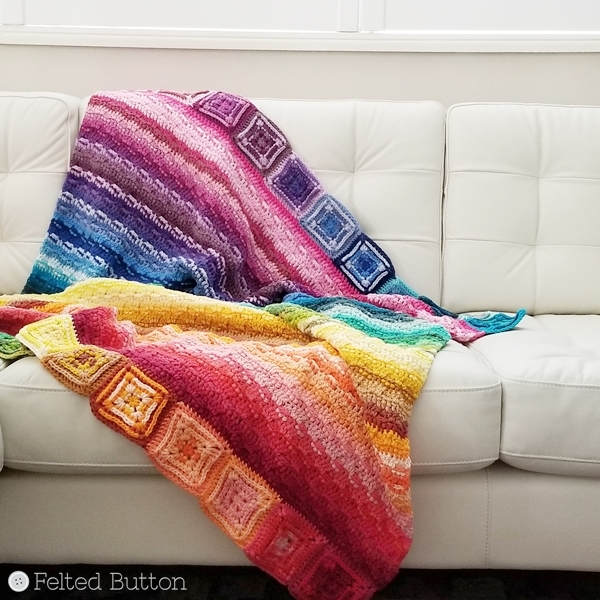 Last week I teased you with some photos of my newest blanket pattern here made with Scheepjes Cahlista Colour Pack* that I shared about here. Today is the day I share the free crochet pattern with you. And since I used almost every bit of each, I named it Every Bit a Blanket. 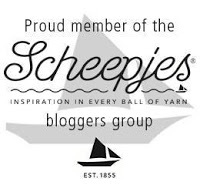 If you want fewer colors or can't get your hook into a colour pack, you can buy larger 50g balls of Scheepjes Cahlista in your color choices here*. All in all, I used approximately 2089yds/1,910m of aran/worsted cotton yarn with my 4.5mm (#7) hook. 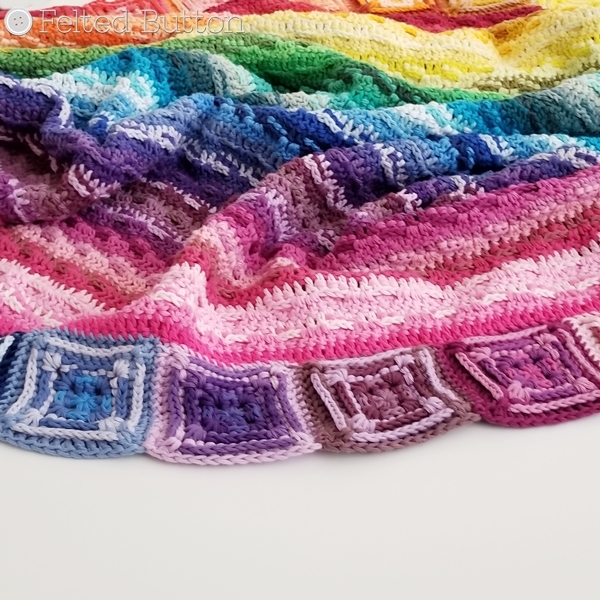 Since gauge might matter a bit so you have enough to finish the squares for each end, you should get 7 rows x 15 dc (US terms) in pattern for 4in/10cm. The squares measure 3.5in/8.9cm each side. My finished blanket's dimensions are 42in x 52in (107cm x 132cm) which is a nice size to drape and snuggle under, I think. ~~The blanket body is worked in rows, turning and changing colors at the end of each row. Then the motifs are worked leaving long tails on Rnd 4 that are then used to whipstitch the motifs to the blanket's top and bottom edges. ~~I use my favorite method for replacing the first dc of a row--and hence "minding the gap" that often comes with a ch-3 start--by using my "stacked sc" that counts as a dc. You can see how I do it here (option #3) and read the description above. ~~The motifs are made with right side facing throughout, joining with a slip stitch at the end of each round. 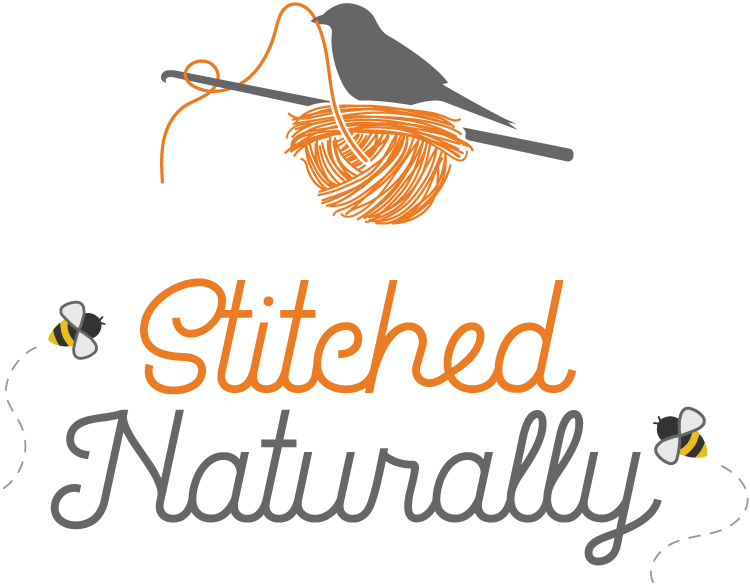 ~~The blanket stitch pattern is worked in multiples of 5 + 2. If you want to adjust the dimensions of your blanket, make your foundation chain a multiple of 5 to your desired width and then add 2 more chains. Work your repeat rows to the desired height. ~~Changing colors occurs on the final stitch of each row by drawing through the new color on the final yarn over and draw through and cutting the old color. Rep rows 2-3 ending on Row 2 rep with last color in sequence, fasten off, weave in ends. Make note that the Row 2 repeats will use more yarn because of the clusters than the Row 3 repeats. When making your motifs, I used the first four colors for the first motif, the next four for the next motif, etc. But I used the colors from the cluster rows for the first two rounds since there was less yarn available and the colors from the regular dc rows for the last two rounds of the motif. You'll have to double a few bits, since in this way the motifs worked up this way would require 88 colors, so some of the bits were used twice. It all worked out really well, though--and helped me use up almost "every bit". I like that. 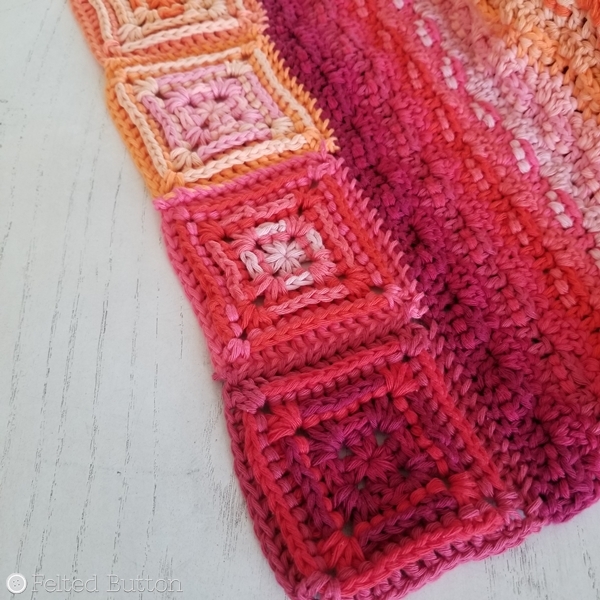 Using the long tails and either a hook or yarn needle, whipstitch the motifs to the blankets edge in a similar color sequence as worked on the row repeats of the blanket. Weave in those ends and block if you desire. I hope you enjoy the pattern! It has not gone through testing, so if you find errors or have any questions, please feel free to contact me via Ravelry or Facebook messages. It's super snowy here in Utah today, so I'm heading out to brave the cold and try to clear a way out of the driveway. Then it will be back inside by the cozy fire to crochet. Now that sounds nice. I hope you have some time to crochet, too. I've got several more colorful crochet creations on my hook right now (never just one wip, right?). You can find me as Felted Button everywhere--Instagram (@FeltedButton), Facebook, Pinterest, Ravelry, Etsy, Craftsy, and LoveCrochet. *This post contains affiliate links. If you choose to use them it costs you no more but provides me a very small commission that helps me continue to provide more free patterns. Thanks! Very pretty. I find color helpful especially during winter when it seem to be dark and dreary at times. Your blanket certainly qualifies as breaking through the dark stuff. Beautiful! Just the box of yarn itself is so cheerful, the blanket is especially so. Thanks for your sincere and kind comment, Sarah. I certainly do adore color. And it makes my heart happy to know others enjoy the colors I use in my patterns. I'll give some thought to a book! 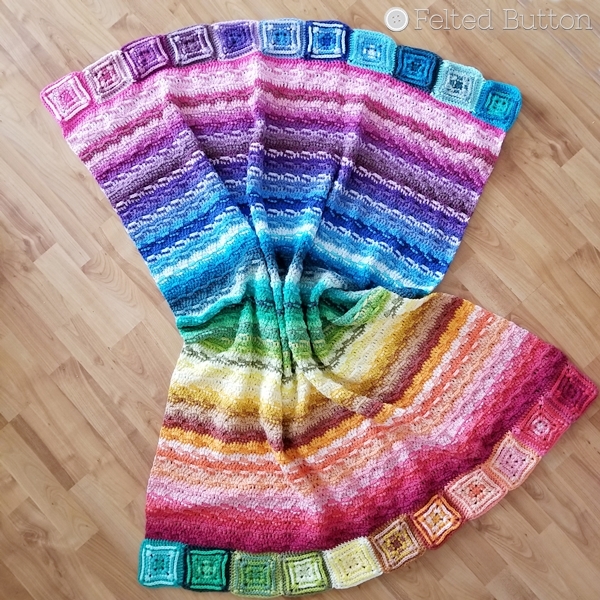 This is a very beautiful rainbow blanket <3 It would be lovely if you shared how much of which color you used or if there was a yarn kit!!! :) Thank you so much! I used 84 colors, 15g each. The yarn kit is there Scheepjes Cahlista Colour pack linked above. 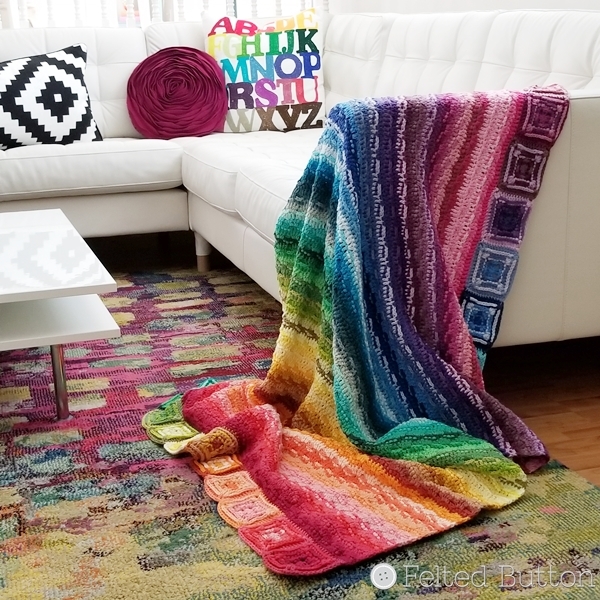 What a beautiful blanket,I love rainbow blankets! I have a dilemma, unfortunately Wool Warehouse won’t ship the color pack to the US due to the weight of the pack. 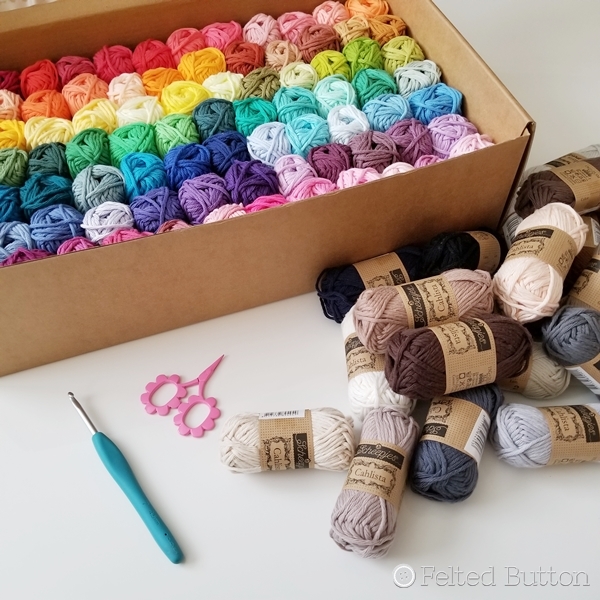 I know it’s too much to list all the colors you used, however could you list the ones you didn’t use since it looks I’ll have to order the individual larger skeins. Actually maybe some of the lighter ones, I can figure out most, but I’m not sure which of the lighter colors you used and didn’t. Thank you for your lovely work, I’m always planning on doing your Trio Blanket as well! It's probably easier to tell you what I didn't use. Grets, whites, creams, trans, browns or black. From the light ones, I only chose those with a hint of the colors of the rainbow. Have fun! It's a delightful project, I think.